Based on the principles of classical and operant conditioning theory, the first behavioral treatments for gambling tried coupling aversive stimuli, usually small electrical shocks, to the memory of gambling. Two studies comparing aversion therapy with other treatment modalities failed to confirm an initial enthusiasm prompted by case reports. Dickerson first emphasized the role of intermittent reinforcement schedules in the persistence of gambling. Petty and Roll highlighted 4 other factors that related to operant learning principles found in gambling. First, low response cost relates to the effort required to place a single bet and to the possibility that winning is usually low, from both physical and economic points of view. Second, magnitude of reinforcement indicates that, to guarantee the business profitability, gambling odds have to be in favor of the gambler losing money rather than winning. Nevertheless, occasional big wins are expected, providing the illusion of a pro-player activity. Priming, the third, signifies that gambling machines will also offer small wins, which aside from lowering the cost of continuous playing and enhancing variability of the reinforcement schedule, may also suggest that a bigger win is just around the corner. Other priming strategies include casinos' sending invitations for a free meal to regular customers who have been away for longer than usual. Fourth, immediacy in deliverance of the reinforcement is crucial; recent evidence has demonstrated that fast-paced gambling machines are more likely to develop problem gambling than are lotteries and other games that allow longer intervals between the bet and the outcome. Indeed, gambling reinforcement schedules seem like a real life compendium of Skinnerian principles. The operant conditioning approach, however, does not explain the recurrence of gambling behavior after a gambling session is terminated, including relapses after long-term abstinence. Brown postulated that the arousing properties of gambling enabled the association of the behavior to circumstantial stimuli. Such stimuli would become triggers for gambling behavior. For this reason, Brown proposed a return to the classical conditioning model—but this time, with emphasis on cue exposure rather than on aversion therapy. Two therapeutic processes of exposure and desensitization have been described: imaginal and in vivo. The imaginal exposure has the patient seated or lying down and relaxed. Next, the therapist asks the patient to mentally picture the typical circumstance that leads to gambling. The therapist conducts the client through a script, whereby the patient ends up with a mental picture effacing a gambling opportunity. At this point, the therapist actively suggests a response other than gambling (that is, to leave the place and to engage in another activity). The session ends with breathing and other relaxation techniques. In vivo exposure follows the same process: it leads the patient to face a gambling opportunity and then prevents the response. Yet, it differs in that the client is asked to actually stand for a while in front of the gambling machine, table, or game device. To reduce the potential for relapsing, the client is gradually exposed by manipulating other elements; specifically, distance, money availability, and external aide from a cotherapist. Data on the efficacy of both methods are scarce. Imaginal desensitization compared positively over aversion therapy in 1 study. In vivo exposure has been compared with cognitive restructuring, using a combination of both techniques and with a waiting list control group). In vivo exposure had the best outcome. Surprisingly, the combined treatment did not show a better outcome than did the waiting list. Only 1 study compared both exposure methods. In this study, we compared imaginal desensitization with in vivo exposure, aversion therapy, and relaxation technique. Imaginal desensitization had the best outcome, and aversion therapy had the worst outcome. Yet, brief descriptions preclude appraising whether the in vivo exposure was properly conducted. In fact, Echeburua has stressed the importance of carefully coaching the patients to observe gambling machines, as well as to watch players, but to restrain from actively following the outcomes on the screen, which could be equivalent to a mental relapse that would invalidate the exposure. Further, behavioral approaches have been criticized for not taking into account individual differences and internal processes, such as personality, cognitions, and emotions. The behaviorists' dismissal of internal processes left a void that was later occupied by cognitive theory. Since the late 1970s, authors have pointed out how random outcomes in chance games influenced cognition and how distorted thinking is associated with gambling persistence. To crack the mind's "black box," researchers have applied a method called "thinking aloud," which includes subjects taking part in gambling and in talking about their reactions and interpretations of the outcome. Initially, this method was used in the laboratory and then further validated in actual gambling settings. These studies demonstrated that a series of small wins prompted illusions of skill and control over chance games, as well as a direct relation between irrationality and increased values per bet. Moreover, cognitive researchers have pointed out that, in addition to the variable intermittent schedule of reinforcement prompted by chance, other features have been added to games that may further reinforce false beliefs of control and skill. Games like Keno allow the player some choices, such as controlling the speed of the draw and selecting the numbers before the draw takes place. Although none of these actions can influence the outcome, the players are more confident in a positive outcome if they are the ones choosing rather than having to endorse a predetermined setting. The other mechanism is the so-called "near-miss effect," which is more readily observed in scratch cards, slot machines, and other games that require the gambler to obtain a series of numbers or symbols, (for example, 2 cherries in a row when the minimum prize combination is 3). Usually by law, gambling operators are forced to ensure game fairness by guaranteeing the randomness of the general outcome and by assuring a minimum proportion between wins and losses. Near misses occur more frequently than expected if due to chance, and they augment the reinforcing properties of gambling at no extra expense to the game's owner. Recently, Toneatto catalogued several types of cognitive distortions that are held by pathological gamblers. In summary, the distortions evolve around misconceptions about randomness and its main derivatives: unpredictability and independence of events. Prediction skills play, at best, only a partial role in gambling (that is, in horse races, sports betting, or cards), and virtually no role in games such as craps, slot machines, lotteries, and video lottery machines. Likewise, because each draw is independent, the next outcome will hold no commitment to past results or to the gambler's needs. Nevertheless, gamblers believe that their actions, their betting choices, or their personal attributes are likely to influence the outcome. This is usually expressed in terms of "gambling systems," held by heavy gamblers, which combine reading spurious signs in the environment, becoming confident in their ability to persuade fate, and using betting methods with varying degrees of complexity that deny the independence of events. Cognitive restructuring therapy is based on identifying false beliefs about gambling and replacing these with realistic understandings. Cognitive restructuring is most likely the most studied treatment modality for pathological gambling, but most reports are still based on uncontrolled case series. 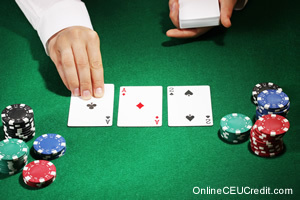 So far, 2 controlled studies have evaluated cognitive restructuring for pathological gambling. In 1 study, cognitive restructuring was part of a treatment package that also included problem-solving, social skill training, and relapse prevention. This study, however, did not discriminate between whether therapeutic success was due to cognitive restructuring or to other techniques in the package. Hence, Ladouceur and colleagues compared a cognitive restructuring that solely combined with relapse prevention, with a wait-list control group. In general, the studies showed that treated subjects had significantly improved on various measures, such as frequency of gambling, perception of control, perceived self-efficacy, and desire to gamble. The preceding section contained information regarding behavioral and cognitive approaches to treating pathological gambling. Write three case study examples regarding how you might use the content of this section in your practice.